One of the most dynamic sectors of the sharing economy is the trend in large cities toward more collaborative consumption — and the entrepreneurs have followed, from Airbnb to Getable to Freecycle. Whether it’s co-working, bike sharing, exchanging books and videos, or cohabiting hackerspaces and community garden spaces, there are green shoots throughout the economy that suggest the way we work, play and learn is changing due to the impact of connection technologies and the Great Recession. This isn’t just about the classic dilemma of “buy vs. rent.” It’s about whether people or organizations can pool limited resources to more efficiently access tools or services as needed and then pass them back into a commons, if appropriate. Speaking to TechCrunch last year, Lauren Anderson floated the idea that a collaborative consumption revolution might be as “significant as the Industrial Revolution.” We’ll see about that. 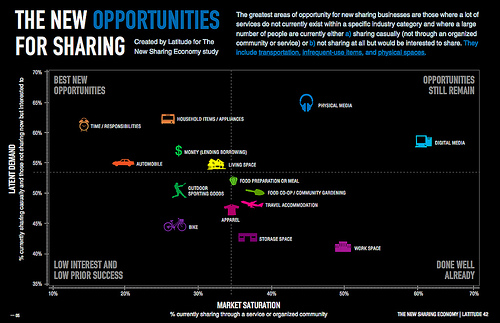 The new sharing economy is clearly a powerful force, as a recent report (PDF) by Latitude Research and Shareable Magazine highlighted, but it’s not clear yet if it’s going to transform society and production in the same way that industrialized mass production did in the 19th and 20th centuries. What is clear is that, after years of spreading through the private sector, collaborative consumption is coming to government, and it’s making a difference. A specific example: Carsharing via Zipcar in city car fleets is saving money and enabling government to increase its efficacy and decrease its use of natural resources. After finally making inroads into cities, Zipcar is saving taxpayers real money in the public sector. Technology developed by the car-sharing startup is being used in 10 cities and municipalities in 2012. If data from a pilot with the United States General Services Agency fleet pans out, the technology could be also adopted across the sprawling federal agency’s vehicles, saving tens of millions of dollars of operating expenses though smarter use of new technology. As with many other city needs, vehicle fleet management in the public sector shares commonalities across all cities. In every case, municipal governments need to find a way to use the vehicles that the city owns more efficiently to save scarce funds. The FastFleet product has been around for a little more than three years, said Serafino. Zipcar started it in beta and then took a “methodical approach” to rolling it out. FastFleet uses the same mechanism that’s used throughout thousands of cars in the Zipcar fleet: a magnetized smartcard paired with a card reader in the windshield that can communicate with a central web-based reservation system. There’s a one-time setup charge to get a car wired for the system and then a per-month charge for the FastFleet service. The cost of that installation varies, predicated upon the make of vehicles, type of vehicles and tech that goes into them. Zipcar earns its revenue in a model quite similar to cloud computing and software-as-a-service, where operational costs are billed based upon usage. “Lots of cities have departments where someone occasionally needs a car,” said Matthew Mayrl, chief of staff in the Boston Public Works department, during a phone interview. The utilization issue is the key pain point, in terms of both efficiency and cost. Depending on the make and model, it generally costs between $3,000 and $7,000 on average for a municipality to operate a vehicle, said Serafino. “Utilization is about 30% in most municipal fleets,” he said. While Boston did decide to join up with Zipcar, public sector workers aren’t using actual Zipcars. The city has licensed Zipcar’s FastFleet technology and is adding it to the existing fleet. One benefit to using just the tech is that it can be integrated with cars that are already branded with the “City of Boston,” pointed out Mayrl. That’s crucial when the assessing office is visiting a household, he said: In that context, it’s important to be identified. Boston started a pilot in February that was rolled out to existing users of public works vehicles, along with two pilots in assessing and the Department of Motor Vehicles. The program started by taking the oldest cars off the road and training the relevant potential drivers. Using carsharing, the city of Boston was able to reduce the number of vehicles in the pilot by over 50%. While a 50% reduction in fleet size looks like significant cost savings, Serafino said that a 2:1 ratio is actually a conservative number. Serafino estimated the reduction represents about 50% of the opportunity for DC to save money. “The leader of the DC Department of Public Works wants to do more,” he said. “The final plans are to get to a couple of hundred vehicles under management, resulting in another reduction by at least 200 cars.” Serafino estimated potential net cost savings would be north of $1 million per year. There is a floor, however, for how lean a city’s car fleet can become — and a ceiling for optimal utilization as well. “The more you reduce, the harder it gets,” said Serafino. “DC may have gone too far, by going down to 80 [vehicles]. It has hurt mobility.” If you cut into fat deep enough, in other words, eventually you hit muscle and bone. Given that FastFleet has been around for more than three years and there’s a strong business case for employing the technology, the rate of adoption by American cities might seem to be a little slow to outside observers. What would be missing from that analysis are the barriers to entry for startups that want to compete in the market for government services. The problem, Serafino mused, was not making the case for potential cost savings. “Cities will only act as sensitive as politics will allow,” said Serafino. “Boston, San Francisco, New York and Chicago are trying. The problem is the automotive and vehicle culture,” Serafino said. “That, combined with the financial aspects of decentralized budgeting for fleets, is the bane of fleet managers. Most automotive fleet managers in cities don’t control their own destinies. Chicago is one of the very few cities where they can control the entire fleet. Cities do have other options to use technology to manage their car fleets, from telematics providers to GPS devices to web-based reservation systems, each of which may be comparatively less expensive to buy off the shelf. One place that Zipcar will continue to face competition at the local level is from companies that provide key vending machines, which are essentially automated devices on garage walls. Zipcar is continuing along the long on-ramp to working with government. The next step for the company may be to help Uncle Sam with the federal government’s car fleet. As noted previously, the U.S. General Services Agency (GSA) has already done a collaborative consumption pilot using part of its immense vehicle fleet. Serafino says the GSA is now using that data to prepare a broader procurement action for a request for proposals. The scale for potential cost savings is significant: The GSA manages some 210,000 vehicles, including a small but growing number of electric vehicles. Given congressional pressure to find cost savings in the federal budget, if the GSA can increase the utilization of its fleet in a way that’s even vaguely comparable to the savings that cities are finding, collaborative consumption could become quite popular in Congress. If carsharing at the federal level succeeded similarly well at scale, members of Congress and staff that became familiar with collaborative consumption through the wildly popular Capital bike sharing program may well see the sharing economy in a new light.